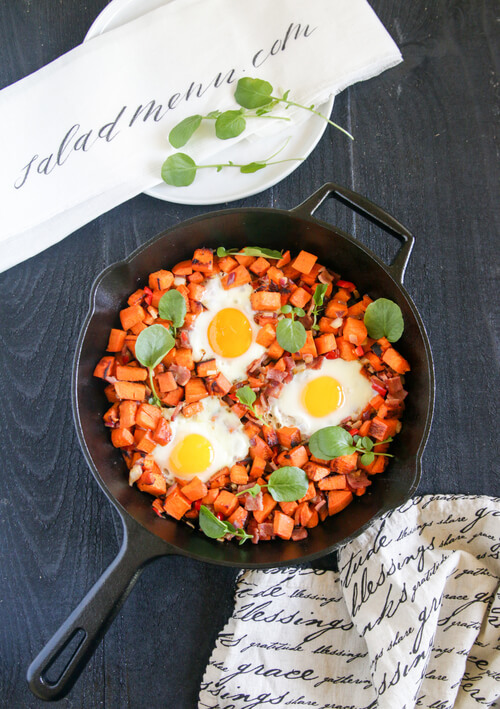 Sweet Potato Egg Skillet can be served anytime of day. Although sweet potatoes in this dish could be replaced with other kind of potatoes, keep in mind the health benefits do change. The sweet potato has vitamin A/Beta-carotene, an important antioxidant giving this veggie it’s orange color, but it also has less calories than other potatoes and a lower glycemic index (meaning it has a slower rate of sugar absorption). If you are looking to use yams, you should know that they are not the same as sweet potatoes, despite popular opinion. They are actually very different, you could usually tell the difference right from the color. When it comes to nutrition, sweet potatoes are much higher. Compared with yams, have much more beta-carotene, an antioxidant nutrient thought to guard against certain cancers. Turkey bacon, in this recipe, sources you with protein and vitamin B12. White potatoes are higher in calories than a sweet potato, but have the same amount of fiber (skin on). If you keep the skin on when using white potatoes, it does have more magnesium, iron and potassium, an electrolyte linking to help lower blood pressure. Cook bacon in a large nonstick skillet over medium heat until edges begin to brown. Add in olive oil and sweet potato; stir and cook until potato is tender. 7-8 minutes. Add in onion, bell pepper and salt; stir and cook for another 2 minutes. Form 3-4 wells. Crack eggs into each well. Cover and cook till egg whites and just set but the yolks are still runny. Add in fresh watercress and serve.